A magnificent rainbow arched the western sky as I approached Belmullet. The old stories tell us there a pot of gold at the end of the rainbow. There was no pot gold at the end of this one, but there was a treasure. It’s called Carne Golf Links. North west Mayo is probably the most isolated and least developed area of Ireland. The last stretch of the road to Belmullet crosses a desolate expanse of bog. You would have to wonder what stimulated the earliest human facing this landscape to keep going, maybe the first settlers arrived by sea. And maybe its because of its seclusion that there is such a warm welcome to strangers on the peninsula. Erris Tourism, a community owned and controlled company set up to promote visitors to the area built an eighteen hole golf course on 260 acres of commonage that opened in 1993. 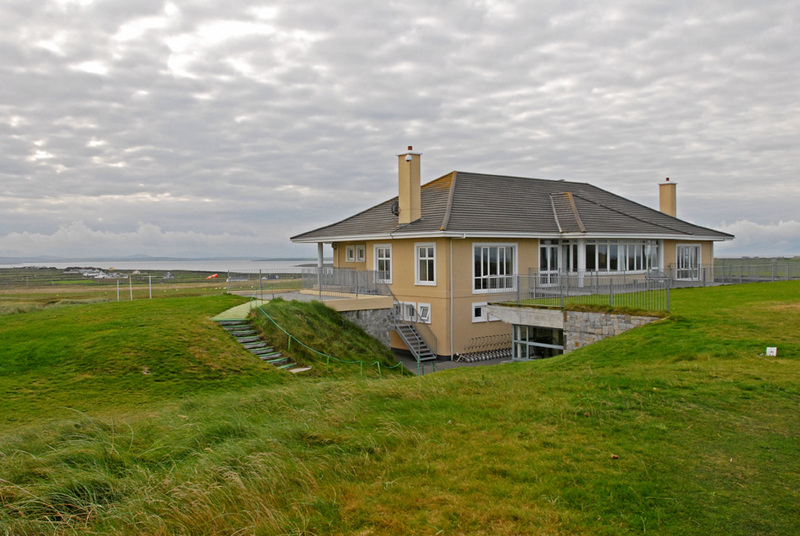 Belmullet Golf Club, which had operated a nine hole course nearby since 1925, became the resident club at the new course. And what a truly inspired golf course they built! It is difficult to exaggerate the splendour of Carne. Positioned on a peninsula between Blacksod Bay to the east and the wild Atlantic to the west, the course – the last to be designed by legendary links designer Eddie Hackett – uses the towering sandhills and deep valleys with minimum disturbance of the natural contours. Hackett believed in using the natural lie of the land: “I find that nature is the best architect,”, he said, “I just try to dress up what the Good Lord provides and if ever the Lord intended land for a golf course, Carne has it.” And it works beautifully. They did not move mountains to build Carne, they threaded a golf course through them. Massive sandhills and staggering scenery help make this one of the most impressive links courses you are likely to see anywhere. Described locally as “Nature’s Gift to Golf”, the course is carved out of the coastal dunes, following the lie of the wild land, rising and falling as nature dictated. There is a degree of blindness on many holes. The dunes and valleys create naturally isolated fairways, with many raised tees and plateau greens giving an established feel to this relatively new course. It feels like it has been there forever. The fact that Carne is not one of the best known golf links in Ireland may be due in part to a shortage of accommodation for visitors the area – until recently. Now there is the splendid new Broadhaven Bay Hotel and Leisure Centre. The modern ninety bedroom facility offers Play & Stay breaks and a free shuttle service to the golf course, about five minutes away. The Belmullet peninsula is a Gaeltacht, an area where Irish is the native language of the older people and all signs are in Irish and English. Carne golf links follows the same pattern but, not being overly manicured, its minimalist approach also extends to the signage. Unobtrusive arrows point the way but you have to keep any eye to where you are going. I am told they are thinking about putting up a few more signs. It would be a shame to overdo it, as the bare natural appearance is an important ingredient of the course’s character. It is only a minor inconvenience for those playing the course for the first time and the cure is delightfully simple – play it again. The course opens on a high tee box and the views are truly spectacular. Anxious as I was to get going, I found myself turning my back on the par four to absorb the panoramic vista. The opening hole is an uphill dogleg right with the green set on a ledge. Careful positioning of the first shot is the key. The 2nd hole at 200 yards is the longest of the par threes. The green is in a hollow and with a little space around the green a par is not out of the question. Any par you get in Carne is well earned. The par five 4th starts over a small hill and the fairway is blind from the tee. You would do well to keep a bit right. The fairway is more generous than it appears with the course boundary deceptively close to the left. It is not overly long and careful positioning rather than great length will get you there in regulation. The 7th is a straightforward 174 yard par three but the green is about fifty feet above you. Clubbing here is everything and with the prevailing wind from the left, making the green is no mean feat. All of the par threes in Carne are exceptional. The 14th is shortest at 136 yards but with a tight fairway the green makes a small target, sloping front and back. If you can pull yourself away from the magnificent views from the tee box right on the coastal boundary of the course, a par here is a great result. The last par three, the sixteenth, is 155 yards with the green well below the high tee. It should be no more than an 8 or 9 iron. Two large bunkers on the left make accuracy all the more important here. The 10th is another blind par five but it has a generous fairway that starts uphill and then down to a green in an amphitheatre of sand dunes. The terrific 11th is a sharp dogleg to the right and at 328 yards you try the shortcut over a large hill known to locals as Mount Everest. It is a dangerous route as the raised green, in the unlikely event you hit it, is hard to hold from distance. You would be well advised to leave your driver in the bag here. This is a strategist’s golf course and it defends itself well against big hitters. This hole is a great example of that. The 12th, a short par four of a little over 300 yards is a sharp dogleg left. Position is everything here to set up for the approach to the raised green. The rough in Carne is not as unforgiving as many links, but you can still have what a caddy on one occasion described to me as a “bacon ball”. Once at Lahinch, as I began to grasp my dearth of options on a steep grassy slope where my ball had disappeared, he explained there was little chance of finding it: “If you wrapped a rasher around that ball, Lassie couldn’t find it”. Carne’s 13th is probably the most ordinary hole on the course, a straightforward par five with only the course boundary on the right to give any trouble. It is known locally as “the calm before the storm” as you move on to the tricky par three 14th and spectacular fairway of the 15th, probably the course’s signature hole. The undulating fairway here rises to a fairly generous green with a sneaky little bunker hidden at the back, one of only twenty-nine bunkers on the course. The par four 17th presents no big danger but reaching in two here is no mean task for the average hitter. The 18th is a long par five and you could hide a house in the hollow in front of the green. It is branded as “hell” and it has spoiled many a good card. Carne is a stunningly beautiful place and a great test of golf. Comparisons to Lahinch, Portrush and Ballybunion are inevitable, but with green fees in Carne being less than half those of any comparable links, it is a real bargain. The only thing I could say against it is remoteness, but it is well worth the trip and, for any discerning links golfer, simply unmissable. Christy O’Connor Snr had a hole in one on the 164 yard second. Overseas life membership is available. Knock airport is an hour and half from Belmullet and serves many UK airports. Scheduled flights to Manchester, Birmingham, Bristol, East Midlands, Luton and Stansted. Belmullet is 185 miles from Dublin and 200 from Belfast. 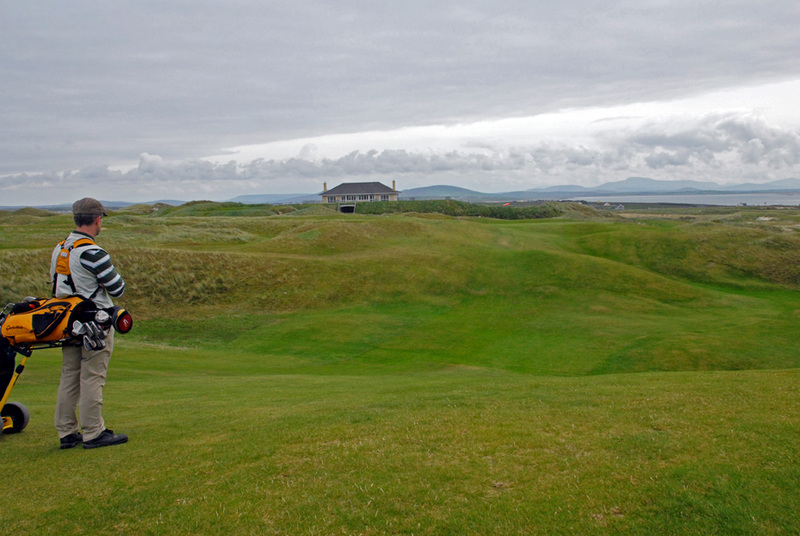 *Carne is a member of West Coast Links, a group of six links courses that includes Ballyliffen, Connemara, Donegal, Enniscrone, and Rosses Point. Booking can be co-ordinated between the clubs.